Shireen Fabing is one of Kingsway Boxing Club’s master class boxers and an incredible ambassador for boxing. After picking up the sport she decided to take it to the next level, competing in the Fight To End Cancer (www.fighttoendcancer.com) charity boxing show in 2013. She never looked back and continues to train, fight and live boxing. Are you over 40 and considering what exercise will get you through this next stage of your life? 40 is the new 30 and your body will love and perform better for you for this next era with just the right balance of exercise and intensity. Here’s why all women regardless of fitness level should be taking up boxing as part of a weekly fitness regime. 1. Physical: From the first moment you throw a punch, you are breathing heavily, heart pumping, arms, chest, shoulders, core, and legs working in unison. Boxing burns over 500 calories/hour, builds lean muscle, develops stamina and endurance, and triggers the metabolism. As we age, we lose muscle mass, strength, flexibility, and balance. Boxing reverses all this, giving us back what we lose, developing hand-eye coordination and entire body strength. 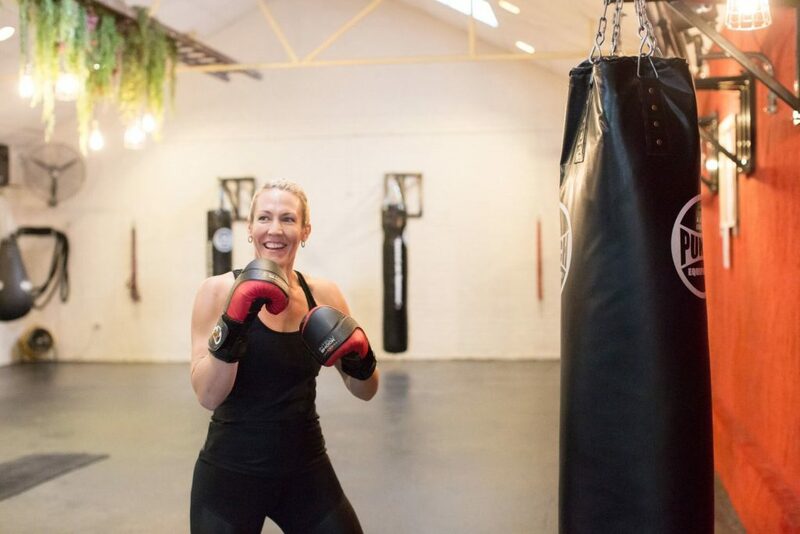 For women over forty, boxing is one of the most complete cardiovascular and resistance workouts … and it is fun. 2. Mental: Boxing forces women out of our comfort zone, overcoming fears, and requiring 100 percent mental concentration. It is demanding and strategic, stimulating new parts of our brain, challenging our minds and bodies. The research on successful aging urges us to learn something new, strategic, and to keep testing ourselves with new sequences and moves. Sure we can push our minds doing Sudoku and crossword puzzles, learning new foreign languages, even attempting to learn new card games, but boxing is both physical and mental. To box is to be steeped in rhythm and movement, coordinating the swing of hips, the swivel of feet, and the power of the arms. It is exhausting, exhilarating, fun, and immensely rewarding. I swear when I walk out the door I’m 10ft tall and invincible. Any problems in my world have melted away and I feel like I could take on the world. Boxing is for EVERYBODY! With programs for girls, women, kids, teens, even men over 50… Just try it out!